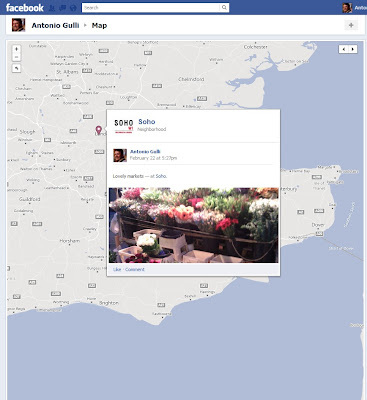 Facebook recently allowed to tag postings (e.g. status, pictures, and so on and so forth) with locations. Anyway, this information is not available via the OpenGraph API, as discussed here and here. Can we have it? This is useful for exploring the OpenGraph and this is useful for building apps. 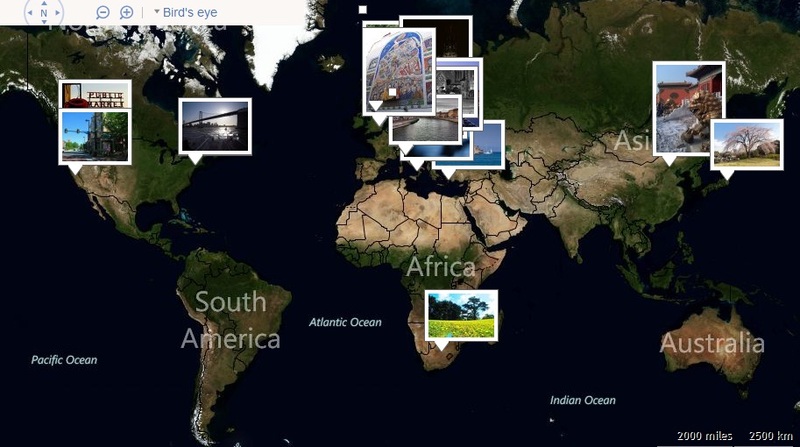 Places where you and your friends have been: Geo-tagging your Social Pictures) and i was not aware that Facebook was working on something similar. So we shipped one day before the f8 and that day Facebook shipped something similar as you can see from my timeline here below. This is apparently based on my pictures and the tag you have in your mobile phone. It seems that you cannot see the pictures from your friends around a place. You are given a number a and a sequence of numeric intervals ( .., ..) . What data structure would you use for searching the number in the intervals? What if they are overlapping? Sharing your pictures with your friends is an important part of your social activities, and a killer application for Facebook. Anyway, I thought that something was missing for that feature. During a recent journey to Ibiza, I said to myself: "Hey it would be cool to see the pictures of my friends who have been in this place before?" 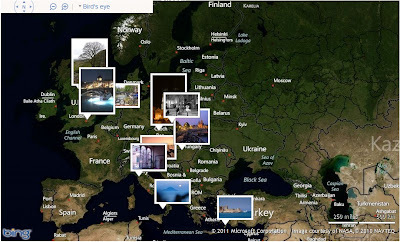 So I went to Facebook and was looking for a way to search the places where me and my friends have been. Surprisingly enough, that feature was not there. I said "uh! let's change that". So I work for Microsoft, but I also like to play with other players' API during some off-work long night programming sessions. 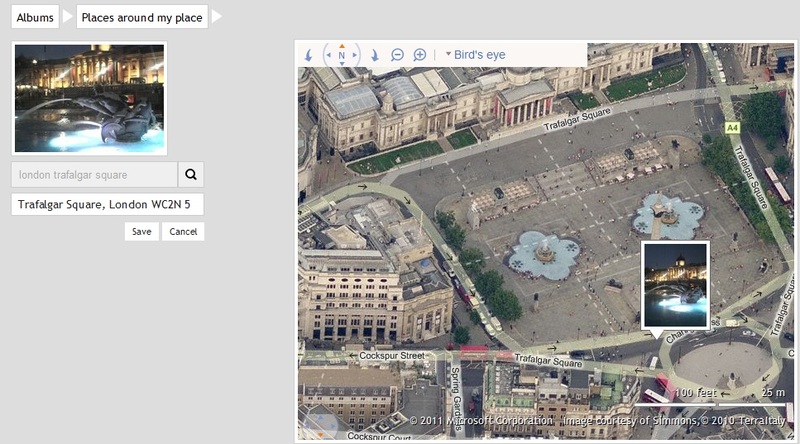 I said: "maybe I can create a mash up using Bing Maps and Facebook API. Let's start with something simple and map the face of my friends over a Bing Map". That worked and was fast to implement. You can load your facebook albums, select a specific picture, and associate this picture with a geographical place. 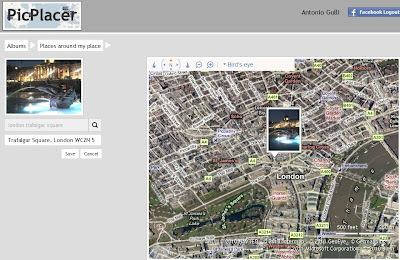 Picplacer.com runs on the top of giants' shoulders and will search the appropriate information from Facebook and Bing on your behalf. 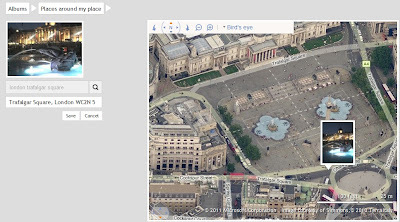 You can drag and drop the picture so that you will fine tune the position of the image in the map. You can even zoom in and out according to your needs. And we are actively working for adding the possibility to show the public pictures that your Social friends have shared for a specific place. But this will probably require another week of work late at night with strawberries and coffees (we already have that information and we know how to use it). Send more coffees, strawberries and suggestions if you want to see more or if you have an opinion. We are going to add that missing search feature in Facebook and allow you and your friends to search and see the places where you have been. DISCLAIMER: Antonio works for Bing Microsoft in London and Mario is an ex-student of mine. Picplacer is a mashup that me and Mario have developed just for fun and is not rappresenting any official Microsoft or Facebook initiative. It's something we made just for fun and for our own pleasure to experiment with fast prototyping and making an impact. That's it. I already posted about using Social Graphs (either Facebook or Skype) for making mobile payments and transactions. See my postings "A feature suggestion for Skype: turning skype in a cash-cow machine for mobile payments" and Facebook Social Wallet. The idea is to use Facebook Login (or Skype Login) and transfer Facebook/Skype credits from one account to another in a secure way (see the postings for the details). Today. Google announced their Wallet based on a chip in your phone where they store the credit card. Technically, I don't quite understand why you need a brand new phone with a special custom chip on it. Why this should not work with already available mobile phones (e.g. 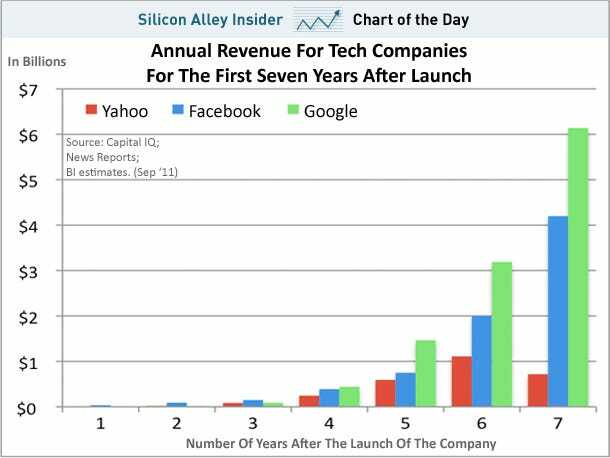 Android, Iphone, Windows mobile, RIM)? Why do I need to buy a new phone for accessing the Wallet? As described in the postings, I propose to just use either Skype or Facebook. Both of them are already running on all the mobiles available on the markets. what is the optimal complexity in time and space? so push in 2nd stack if empty. Another good SQRT(N) trick can be applied to Lowest Common Ancestor (LCA) problem. This problem consists in identifying the lowest common ancestor given two nodes in a tree. One way is to split the tree vertically in SQRT(H) parts, where H is height of the tree. So for each part, we should store the ancestor situated in the part immediately above. That is easy because the ancestor for each border section is the father of the section (e.g. the node at the frontier). Many quadratic algorithms can be "changed" into a linear version pre-processing sqrt(N) "points" so that the algorithm will be a linear one on the subset of selected "points". This is a typical trick adopted in clustering and in many other situations. Let's review some examples. Range minumum queries is the problem of finding the minimum value into an interval. A trivial solution is quadratic and can be computed with dynamic programming, by observing that the minimum for an interval with 1 number is the same number and that we can get the minimum for the interval [i, j] if we know where is the index corresponding to the minimum for the interval [i, j-1]. Back in the late 90ies the first ML course @ stanford had less than 20 students. Next fall they will open the course for online students and more than 50K students (including me) have signed up so far. Consider the opportunity of adding yourself to the list. jsonp is a quite popular paradigm for mashup and crosssite scripting. Sometime is useful to pass a parameter to a jsonp callback. My solution is to encode the parameter in the name of the callback or to dynamically push functions with the parameter embedded in the code. The name of the callback will be a random string. Facebook login became the universal login system. Plus they have a system for buying credits which they use for making transactions such as buying games and other items. It would be interesting to expand this mechanism into a 'Social Wallet' for Social Payments. If a merchant has a facebook login than it can be recognized it in a trusted way. In addition, it would be possible to generate a unique number for each transaction in a way similar to what Paypal is doing today. In this scenario, there will be a set of merchants selling items in real life and using facebook as a payment system. The payment is nothing more but a facebook credit transfer (again similar to Paypal). Likewise, they can use Facebook to transfer social gifts, game points, and other types of virtual objects. The real power of this is that the system will be available for 700millions of users and it would work perfectly for micro-payments. Plus facebook is available on many different devices so it would possible to pay on phones, tablets, and PCs. 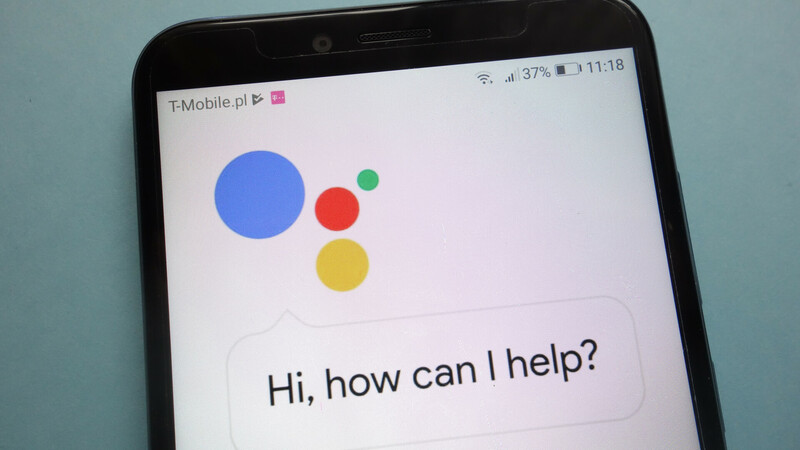 Google is going to shut down many betas. Most notably, Aadwark was a very interesting semantical type of search and Google desktop was a very good piece of software. I really like this problem because it's an interesting application of recursion and it shows your attitude to code paying attention to the details. A BST is a binary tree where the value stored in the left child is less than the value of the current node, which in turn is less than the value of the right child. This would allow to search for the LCA (lowest common anchestor) by leveraging the structure of the tree.